Africa is usually taken to be the origin point of the human lineage, and so far as the later stages of the Pliocene and Pleistocene are concerned this is generally accepted as true beyond reasonable doubt. Nevertheless some doubts about this matter have been raised in recent years—in particular regarding the origins of Homo erectus (White 1995; Dennell 2004)—and it would always be unwise to assume that the fossil record will never surprise us. We return to this point later below. 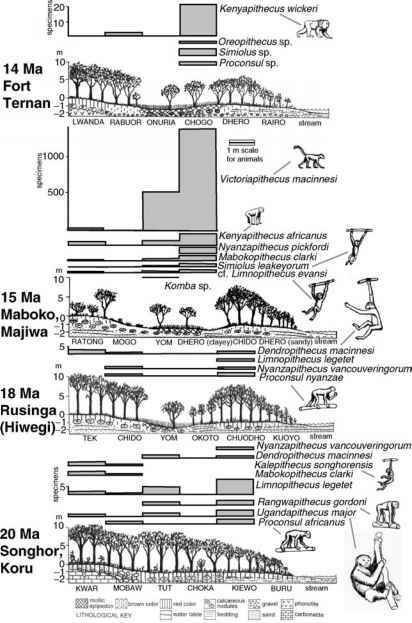 However, as we have seen, the Primates themselves did not originate in Africa, and while emphasizing their incursion during the Oligocene or perhaps even the Middle Eocene may seem like an academic nicety, it is worth stressing that the intermediate period of the mid- and later Miocene witnessed emigrations and perhaps also reimmigrations. Machairodus, a range of mustelids, and a number of antelopes (Vrba 1995; Werdelin and Turner 1996; Turner and Anton 2004). The impetus for this movement appears to have been a major shift in climate, changing the western European vegetation from subtropical evergreen forest to more deciduous and dry woodland and provoking a turnover in mammalian fauna that Agusti et al. (1999) termed the mid-Vallesian Crisis. By around 9 Ma, the dryopithecine hominids were extinct in Western Europe, although they managed to survive until perhaps 7.5 Ma in Italy and China (Andrews and Bernor 1999). A movement of early hominid apes back into Africa is therefore entirely plausible as part of this larger pattern of dispersion.